The recession is certainly taking its toll on Kilkenny. Streets that have, in the past, run thick with bank holiday revellers seem notably quieter – at least in numbers. Bands sill pound out rock classics from what seems like dozens of bars in this tiny city, and those who are still out partying are in no less boisterous mood than ever. The Cat Laughs comedy festival has cut its cloth to match. Only six venues are taking part this year to ensure each gig remains busy, while ticket prices have been reduced to fit the tougher climate. But that’s good news for the comedy fan. On his UK tour Al Murray tickets are more than £25. Here, you can see him in an intimate theatre in a brilliant bill that also includes Jason Byrne, Colin Murphy and Mike Wilmot for just €20. With hair and a beard, the Pub Landlord might look a little softer than usual, but in Ireland, his Little Englander has an extra frisson, those impish insults even more cheekily combative. Especially when the nation’s in hock to the Germans. But the teasing was as good natured as it was close-to-the-bone, and taken in reciprocal spirit. Seeing Murray work a tiny room, his internal put-down spreadsheet and spontaneous banter never less than devastatingly effective, is a treat that arena gigs can never replicate. That compere Byrne also works in the moment added to the unique spontaneity of the night. He seizes on tiny oddities and magnifies them into rich comic seams that run through the night. Godsends such as the father and son in matching Coca-Cola T-shirts are exploited to the full, with Byrne creating more moments of unplanned silliness in one night than many comedians manage in a career. 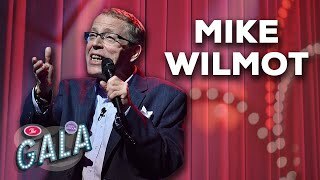 Opening with Mike Wilmot is something of a risk, given the spicy flavour of his material. But despite some reservations in some quarters, his roguishly charming self-deprecation lubricates the harsher edges of routines about having his wife sit on his face, or about the times he shat himself in public. The disgusting images he evokes and his single-minded determination to push into areas that polite society would rather he wouldn’t raises the jeopardy, but he wins – usually – thanks the wittily honest descriptions of moments that remind us all of our base functions. And again he put in a loose performance, in keeping with the spirit of the show. Colin Murphy was more rehearsed in his routine, and subsequently felt a little outclassed by his illustrious colleagues. Although in a late show the following night, he excelled, thanks to a more fluid approach that still landed the punches – plus the brilliant interaction with an American tourist who was certain she’d heard swearing on the Irish news, which prompted a hilarious recreation of what it might have been. Over the rest of his set he offered wry observations about the likes of phoney sports or Prince Charles reading the weather. The writing’s solid, but it’s the robust conviction of the delivery that pushes it through. In another show, in the sizeable Langton’s Ballroom, relative newcomer Chris Kent held his own on a line-up of much more established colleagues. His routines drawn from his youthful everyday experiences such as youth hostelling could be a little tighter on the punchlines but he exudes a thoroughly engaging persona, with an appealing quirk to his storytelling that has you gripped. He knows how to spin a yarn and extract from the funny from any situation, which will surely establish him as a name to watch on the circuit. His bill included David O’Doherty and Neil Delamere, both of whom demonstrated an evolution in their comedy. DOD barely touched his low-budget keyboard – save for the now obligatory Beefs 2012 song that brilliantly condenses bugbears into musical bites – while the stand-up traded in some whimsy for astute social observation, without loss to his immense likeability or good-humoured hilarity. Delamere’s as sharp as I’ve seen him, adding more spike and punchlines to his amiable storytelling skills. Perhaps The Panel has sharpened his competitive streak, as he’s becoming more formidable the more famous he gets. Sticking with the home-grown talent that forms the backbone of Cat Laughs, Gearoid Farrelly isn’t reinventing the wheel, blethering away with camp, gossipy charm. But charm there certainly is, even if you’ll remember the waspish attitude more than any material. Meanwhile, Des Bishop scored lots of home-advantage points with references as parochial as the Kilkenny Ring Road, plus wider observations about the Irish climate – although most of his energetic set concerned emigrants living the good life in Australia, and the unintended consequences of the visa system. He concluded his show with a rap with Doc Brown, the unrehearsed nature of which meant he stomped on a couple of the Londoner’s punchlines, but the upbeat feelgood effect was unmistakable. For his own set, Brown excelled with a couple of expert comedy tunes – most notably the generic [Insert Name Here] which offered a nice twist on cliches. His stand-up – largely about being to middle-class to be a real rage-fuelled rapper – isn’t up to the standard of his rhymes, but enjoyable nonetheless. Other Brits included Milton Jones with his beautifully twisted one-liners with their delayed-drop payoffs, Alex Horne being experimental if perhaps a bit too over-ambitious with a routine that involved miming to his own routine, and the childishly exasperated Josh Widdecombe. You often hear of the funniest joke of the festival, but he had the single funniest word – with a hilarious self-created portmanteau created while experimenting at Nando’s. Meanwhile, mild-mannered Welshman Lloyd Langford deftly handled one of the few tricky customers of the festival, quietly but effectively shutting down the disruptive element without raising his voice. Finally, Australian comedy star Wil Anderson was devastatingly effective with his fast-paced stand-up. If some of it isn’t amazingly distinctive, his description of his personal approach to vegetarianism is, ironically enough, particularly delicious. Anderson was one of only two intercontinental guests invited to play Cat Laughs – the other being the perennial Dom Irrera – despite its reputation for attracting global stand-up stars. But times are tough. However, more than one comic told me that the pared-down nature of the 2012 festival reminded them of the event’s modest, ‘just for fun’ roots, and was all the better for it, with better-behaved audiences and a more friendly atmosphere. Seems like the festival can’t lose.